For use with Halo H7 LED 600 Series and 900 Series LED modules. Rated for direct contact with air-permeable insulation in insulated ceilings, may also be used in non insulated ceilings. 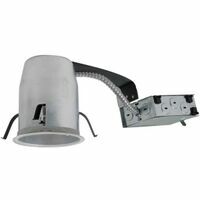 Air-tite fixture sealed and gasketed to prevent airflow between unconditioned areas and living areas. Rated for 15 watts maximum. 10-1/2" length x 7-1/2" width x 7-1/2" height with 1/2" plaster lip. Ceiling cutout: 6-1/2".